Today the Heritage Lottery Fund announced a grant of £409,700 for the Royal Commission’s partnership project: Commemorating the Forgotten U-boat War around the Welsh Coast, 1914-18. 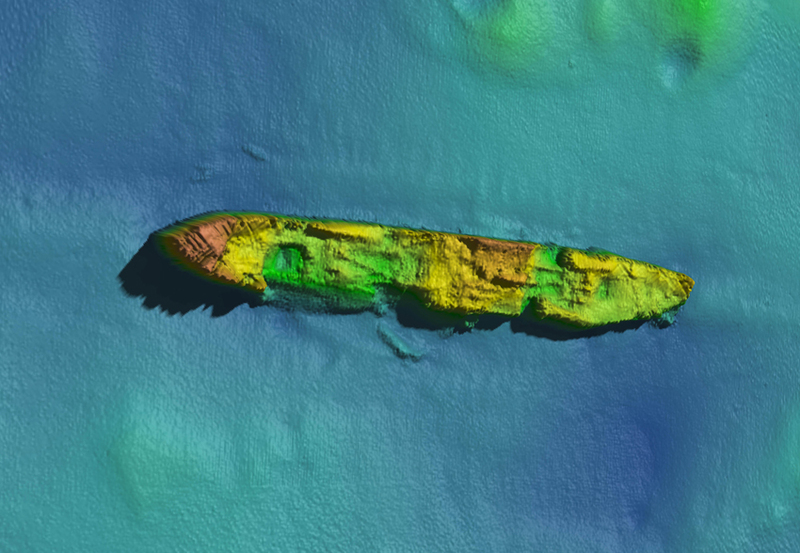 Thanks to money raised by National Lottery players, over the next two years the project will use the latest imaging techniques to reveal underwater wrecks from the Great War, and will support coastal communities around Wales to tell their previously untold stories about the Great War at Sea. Marine geophysical survey will capture high-resolution data of several wrecks, as well as underwater video footage showing the ecology and biodiversity of the wreck sites. This work will be carried out by the Centre for Applied Marine Sciences at Bangor University and they will also be holding Community Activity Days on the theme of Great War in the Marine Centre Wales, Menai Bridge. The Marine Conservation Society’s Seasearch initiative will be gathering ecological information from the wrecks. As part of the project, the Nautical Archaeology Society will be providing training in underwater archaeology for sports divers at two sites in north and west Wales. A network of museums will also be undertaking activities relating to Great War at Sea themes during Wales’ Year of the Sea, 2018. Scientists from Bangor University (who have been surveying the coast of Wales as part of ERDF-funded SEACAMS2 project led by the University in partnership with Swansea University) are also surveying a number of additional shipwrecks located around the Welsh coast. Data from these surveys and the work resulting from this project will provide new insights to marine renewable energy companies on what might happen when artificial structures are placed in the same or similar areas of seabed. 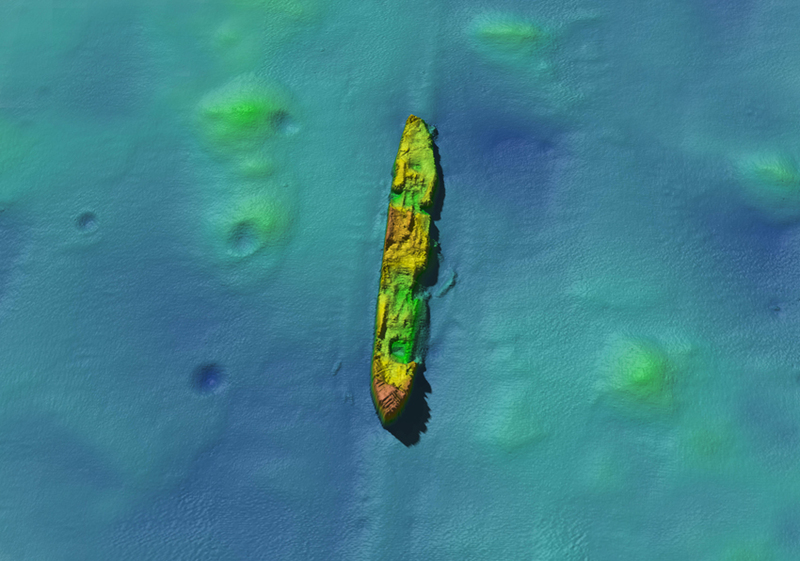 The image gathered by the SEACAMS2 project above shows a recent survey image of the wreck of the DAMAO torpedoed by U-91 on 28 April 1918. The ship was built as the BRISBANE in 1911 for the German-Australia Steamship Company. At the company’s height in 1914, it was the fifth largest German shipping operator. The outbreak of the war saw the BRISBANE caught in a Portuguese port; it was taken over by a state-owned company and renamed SS DAMAO. This is a community-based project which will employ two Community Engagement Officers who will support a programme of community activities based at Welsh Maritime Museums around Wales, and using the Welsh Archive Network. They will develop a ‘Community Research Toolkit’ and training materials to guide participants in archive and museum collections and to the resources online. Material generated by these activities will form the core of travelling exhibitions and will be available on the People’s Collection Wales website as well as the Project’s own website. Online digital resources will include underwater footage and 3D models of the wrecks as well as learning resources for schools relating to submarine warfare and sound detection technology. Participants in the community elements of the project will have an opportunity to showcase their work at a Project Conference in November 2018 and a Project Legacy Workshop in September 2019 at the Marine Centre Wales, Bangor University, Menai Bridge. The Royal Commission is the investigation body and national archive for the historic environment of Wales. It has the lead role in ensuring that Wales’s archaeological, built and maritime heritage is authoritatively recorded. The Royal Commission seeks to promote the understanding and appreciation of this heritage both nationally and internationally. The Nautical Archaeology Society is a non-government organisation formed to advanced education in nautical archaeology at all levels by encouraging the participation of members of the public at all stages. They are a registered charity based in the United Kingdom, but with strong links to partner organisations around the world.